The likely favorite is Street Heat (#2), who recently broke through his first-level allowance condition at Parx Racing. However, rather than move him up to the next allowance level, Danny Gargan sets his sights lower and aims for this conditioned $25,000 claimer. While this is a drop in class, he finds himself against an unusually formidable foe for this level. 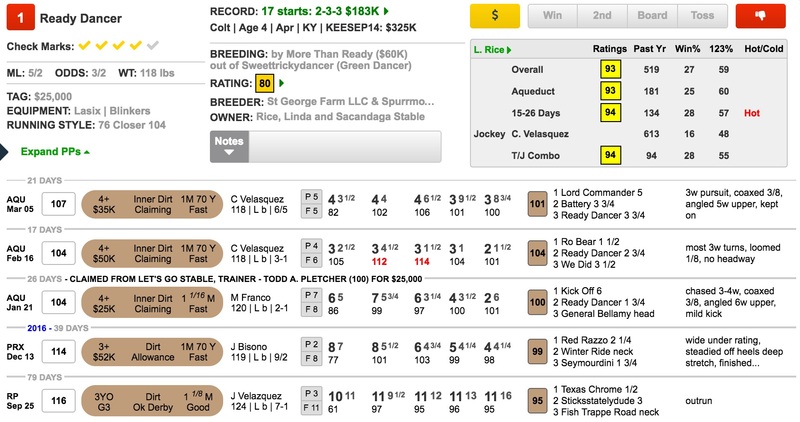 It’s usually not a great sign to see Linda Rice continuing to drop a horse in class after a claim, but READY DANCER (#1) is just right back at the same level that he was claimed for three starts ago. He has also run much better than it appears in both of his starts since the claim. He was wide against inside biases on both Feb. 16 and Mar. 5. The trip he worked out last time was especially ridiculous, as Cornelio Velasquez made no attempt to save any ground and ended up going four wide around the turns. This horse is in much better form than it appears, and I believe he can run down Street Heat.